So I'm trying to build a malicious captive portal but I'm stuck on the part where you need to know stuff. Anytime a HTTP request comes in, everything works fine. However, when an HTTPS connection comes in, it refuses to accept my certificate. My phone wont even let me accept it. So far what I have is the following. Allow traffic to flow freely after the person "logs in"
However, when an HTTPS connection comes in, it refuses to accept my certificate. That's expected. You are trying to man in the middle a TLS connection with a certificate which is either not issued by a CA trusted by the client or where the subject of the certificate does not match the hostname of the target URL. That's exactly the kind of attacks certificate based authentication in TLS is designed to prevent. My phone wont even let me accept it. TLS is explicitly designed to prevent any kind of untrusted man in the middle, which means that captive portals trying to use an untrusted certificate (they usually don't have something else) will not work. You either make the clients explicitly trust the captive portal by importing the intercepting CA into the trust store. Or you must rely on the captive portal detection built into several browsers and OS. This detection basically works by accessing specific URL via plain HTTP and check if the results matches the expectations - if not a captive portal is assumed. See How Legitimate Wifi Hotspots redirect https requests and similar questions on this site for more details. Not the answer you're looking for? 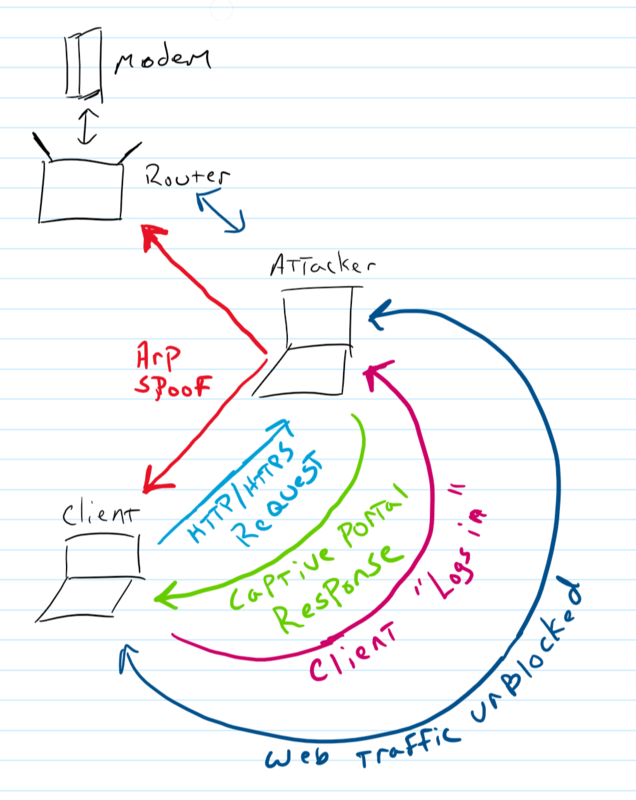 Browse other questions tagged arp-spoofing iptables captive-portal or ask your own question.